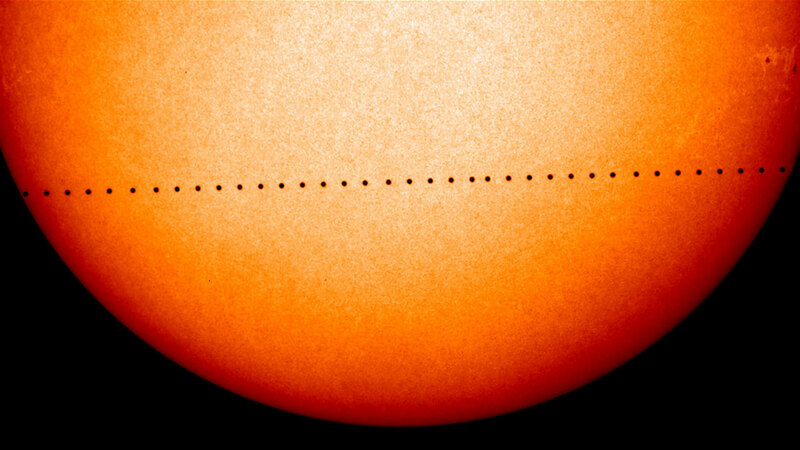 Mercury has begun a relatively rare move across the sun. The solar-planetary ballet got underway just after 7 a.m. on the east coast with the smallest planet appearing as a tiny black dot on the face of the sun. The transit will last for a total of about 7 hours. It will happen again three years from now, but then not until 2032. NASA says the event occurs only about 13 times a century. The passage is known as transiting, and it will only be visible through a telescope or binoculars. NASA urges stargazers to outfit their gear with a solar filter to prevent eye damage. The entirety of Mercury's journey will be viewable to the eastern U.S. and Canada, as well as most of western Europe and South America. To catch a glimpse of the solar-planetary ballet, viewers will need binoculars or telescopes with protective solar filters.